This site lies near the bridge linking Arakabesan and Koror, in a small debris field that includes landing gear.I had traveled by this location many times without noticing the wreckage. However, while reviewing a report on American wreck sites conducted by the American Graves Registration Unit from 1947, I noticed a mention of their finding wreckage of a Corsair at that same location. According to the report, the Japanese had buried the aviator's body but the Graves Unit could make no identification of the aircraft nor person. Interestingly, after-action reports have not been thus far illuminating in suggesting a specific mission linked to this crash site. The aviator's name remains a mystery. During the 2000 P-MAN II expedition, Greg Kovacs took the underwater photo at the site (below, left). 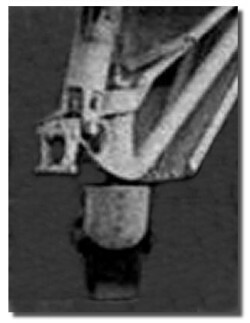 Three months later, based on this photograph, Reid Joyce positively identified the tailwheel assembly as belonging to a TBM / TBF Avenger (not a Corsair). This doesn't disprove the Graves Unit's assertion that there is Corsair wreckage here (that could be true, too), but this tailwheel is definitely from an Avenger. 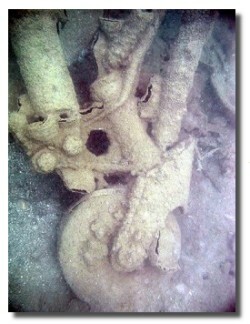 The evidence that this is a TBM component came from a comparison between Greg's underwater photo (below, right) and a portion of a TBM photo that Reid found in NASA's archives. We've prepared a 543KB RealMedia (.rm) movie that morphs back and forth between the NASA TBM photo and the underwater photo. There's also a 1,462KB QuickTime movie (.mov) version of this convincing evidence. As you view either movie, pick out a spot on the assembly (for example, the wheel, a strut, or a bolt head) and focus on it as the picture moves back and forth between the wreck and the file photo.